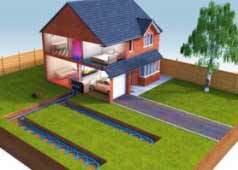 How Ground Source heat pumps extract heat from the ground which can be used to provide your home with heating and hot water. The ambient heat in the ground can be captured and used to heat your home. The sun heats the earth and then pipes buried in the garden can be used to extract the heat from this ground. 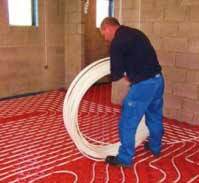 Ground source heat pumps concentrate this heat for use in radiators, under-floor heating systems and hot water systems. Even at depths of only 1 meter, the ground stays at a fairly constant temperature of approximately 12°C all year long, so a ground source heat pump can be used even in colder months. The more modern systems compensate for the weather outside, providing more heat inside when the outside temperature falls. You can save up to £1,000 in energy bills per year with a ground source heat pump if you are currently using electric heating. Over and above these savings there are government grants of £1250 available for fitting a ground source heat pump, and in future they may qualify for the Renewable Heat Incentive which will make your returns even better. They are also eligible to be fully or part funded through the Green Deal scheme which pays for the installation costs. You then pay the scheme back using the savings made on your energy bills, which should make the installation free to you. Calculate how much money you could save! 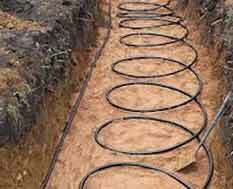 You will need enough space in your garden to bury a loop of piping called a ‘ground loop’ which extracts the heat from the ground, though the ground loop can be buried in vertical boreholes if space is limited. The refrigerant is compressed in a compressor, which concentrates the heat to a higher temperature. The heat is now hot enough to heat water for either heating or hot water. Air Source heat pumps: They remove heat from external air and are an attractive option as they are economic and simple to install, especially if you live in a city with little outside space. Water Source heat pumps: This is a similar system to a ground source pump except that the ground loop is placed in a local water source, such as a river or lake. MVHR (Mechanical Ventilation and Heat Recovery): This is essentially exhaust-air-source; this system reclaims the heat from warm air leaving your home via vents. This system is most efficient in more air-tight, well draught-proofed homes. In England, Scotland and Wales ground source heat pumps do not normally require planning permission, however, you should check with your local authority to confirm that permission is not needed for your project. 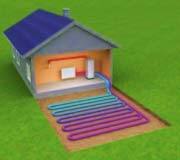 In order to qualify for the Renewable Heat Incentive subsidies the system must be fitted by a MCS accredited installer. Usual locations for the pump include your utility room, basement or even out in the garage. 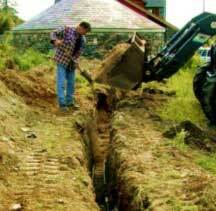 Normally the loop is laid coiled in trenches about two metres deep, and a typical home would need around 600ft. A typical ground source installation for a 2 bed detached house would need (at least) two trenches about 12 inches wide and about 45m long. The trenches also need to be about 15 feet (5m) apart. The trenches will ideally be level to avoid making the pump work too hard and the wetter the ground the better as more heat is conducted. If you have limited space in your garden the loop can be buried vertically in the ground, usually to a depth of up to 10 metres for a typical home. Heating system: Larger radiators, under-floor heating or low temperature fan convectors (warm air heating) are more efficient than conventional radiator-based systems when used with the heat pump because of the lower water temperatures produced by the heat pump system. Do you have any other building projects in mind? You may be able to substantially reduce the cost of the pump installation by combining it with any other building work you have planned. The efficiency of a heat pump is measured by it’s Coefficient of Performance (CoP); this is a measure of a heat pump’s ratio of heat output to electricity input, so the larger the figure, the more efficient the pump. Heat pumps can produce up to 4 kilowatts of heat energy for each kilowatt of electricity they use to generate this energy. An alternative measure known as the System Efficiency Ratio (SER) has been devised by the Energy Saving Trust (EST). This is the ratio of how many units of electricity the whole heating system uses to run compared to the number of units of heat the pump produces. Both the SER and CoP range from around 1 to around 4. A recent study into heat pump performance has found that the mid-range SER for ground source heat pumps was around 2.3-2.5, with the most efficient units reaching 3.3. The installation time for a ground source heat pump system does vary and depends on the size of the system. You can potentially save a significant amount of money on your installation bill by combining the installation with other building work and because of this the installation time will depend on this also. Only MCS accredited installers are able to validate installations that qualify for the government’s Renewable Heat Incentive and Renewable Heat Premium Payment schemes. Installations carried out through the Green Deal must use Green Deal installers. After the one-off installation cost of £6,000- £18,000, how much the system costs to run depends on a number of considerations – including how large and how well insulated your home is. Savings of more than £610 on your energy bills can be achieved annually if you are converting from an oil or electric heating system. You could also receive a grant of £1,250 towards the system’s costs through the Renewable Heat Premium Payment scheme and regular payments for any heat generated through the Renewable Heat Incentive. To find out more about the Renewable Heat subsidies visit our Renewable Heat Incentive page. You can also get your ground source heat pump installation either partially or fully funded through the Green Deal scheme. The Green Deal is effectively an affordable loan service for green home improvements. The scheme pays for the installation and you pay the scheme back monthly with the money you have saved on your energy bill. This means that the installation is “free” to you and should actually make saving overall, but it is not quite as good value for money as paying for the installation yourself as interest is included in your payments. Heat pumps operate differently to oil and gas boilers in that they produce heat at lower temperatures over much longer periods. Because of this, during winter months it is best to leave them constantly switched on to heat your home efficiently. This might seem counter-intuitive at first but they do require a different mindset to operate efficiently.